Monica Roache has lived in the same house her entire life. It just doesn’t feel the same. The fifth generation Georgetowner is one of a handful of native African-Americans left in the neighborhood—largely the product of discriminatory public housing policies and gentrification, before the latter had a name. ‘Thirty to 40% of Georgetowners were African Americans at one time, but there was a massive push out from the 1930s to the 1950s,’ says Monica, 44, a public school administrator and ANC Commissioner. The Alley Dwelling Elimination Act of 1934 played a large role in that exodus, demolishing residencies in the same alleys where homes now go for upwards of $1 million. The Old Georgetown Act of 1950 was another obstacle for many families, as strict historic preservation guidelines made home improvements a financial challenge. From the research Monica’s done, her family came from Southern Maryland slaves. How they got to Georgetown, Monica can’t quite figure out. Still, she says there’s no doubt her family played a role in physically building Georgetown University, and is currently doing genealogy research to investigate further. What she knows for certain is this: Monica’s grandparents purchased her current home on P Street in 1941 for around $20,000—still a lot of money then. Her grandfather worked for the Navy department, served at formal estate dinner parties, rented rooms and worked two or three jobs at any one time to afford the mortgage. Segregation played a large role in that. 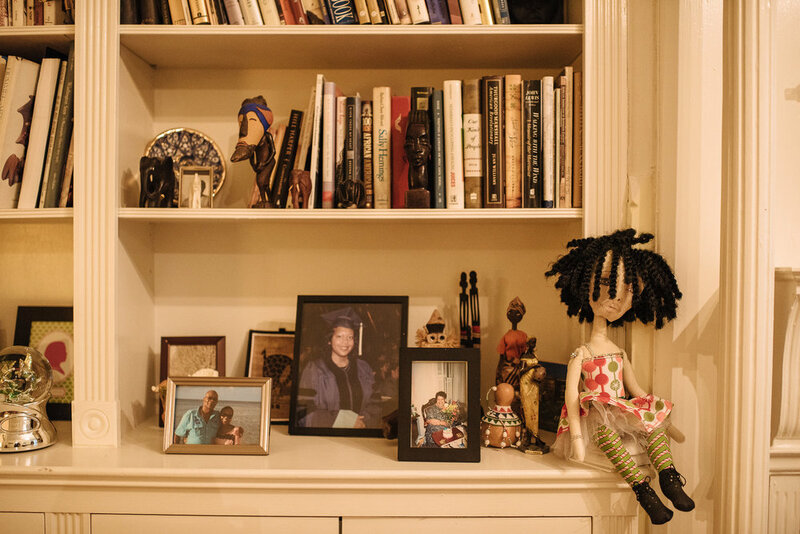 Monica’s aunt—who was 86 when she died in 2008—didn’t have much choice where she socialized; unable to eat at the lunch counters in town and traveling to theaters on U Street to see black artists perform. Monica’s mother was one of the first classes to integrate Western High School in the 1950s—now Duke Ellington School of the Arts. But she still felt isolated, recalling PTA meetings with teachers who wouldn’t wait around to speak with the African-American parents. Growing up in the 1980s with both black and white friends, Monica’s neighborhood experiences were more positive and diverse. Still, she had a sense of the more punctuated, disguised racism that continues today. Monica’s aunt and mother have since passed away. Many of her cousins were part of the displacement as a bi-product of gentrification, but still have strong emotional ties to Georgetown—returning for church celebrations or special neighborhood history events. For her part, Monica has no plans to leave. ‘When my mom suddenly got sick, everyone said ‘you have to keep this house.’ So I’m determined to keep it because I know how hard my family has worked all these decades to maintain it and I don’t want to lose it. Other families fought hard to stay and just couldn’t. Monica uses her platform to keep that history alive. She helped orchestrate the renaming and dedication of the Rose Park tennis courts last year in honor of the Peters sisters, assisted in the archaeological dig to search for the remains of freed slave and Georgetown resident Yarrow Mamout, and recently helped lead a community clean-up day at Mount Zion/Female Union Band Cemetery.